Onza Tires is based in Switzerland and has an impressive lineup ranging from 20-inch BMX to 29-inch MTB tires. Their lineup includes everything from urban, touring, road, cross-country, downhill and enduro. Onza Tires, has largely focused on the European market and is only now making its way into North America. The Lynx is billed as a fast-rolling cross-country race, marathon, all-mountain tire. The tire–as tested–is tubeless-ready, comes with a folding bead and features a 120 TPI casing for lighter weight and reduced rolling resistance. Onza recommends this tire for loose, medium and loose-over-hard soil. They list the rolling resistance and cornering efficiency as 3-out-of-5. The Lynx sports a dual compound tread (RC2) with harder 65a rubber in the center for speed and durability, and 55a rubber on the side for extra cornering performance. I tested these tires in very dry conditions that ranged from loose-over-hard to medium soil, with technical, loose rock sections and fast hardpack. The Lynx tires had decent all-around performance, providing adequate climbing and cornering traction and good stability under heavy braking. A generously ramped leading edge ensures that they roll easily and for that matter, quietly (handy for sneaking up on people). On several technical climbs that had loose material, the tire lost traction suddenly. While this was a challenging surface for any tire, I suspect that the blocky center knobs and generously ramped leading edges contributed to this occasional, but frustrating behavior. However, I should note that in most any-other climbing situation–even loose sand or granular conditions–the Lynx hooked up without any issue. As a front tire, the Lynx brakes well and is predictable in the corners–so long as you keep things under control. While I didn’t experience any serious issues with the front tire breaking loose, I never really found the point where I could really push it with confidence. That aside, my usual preference is to run something a bit wider, lower pressure or with a softer compound on the front, and it has been a while since running identical tires front and rear. Throughout the test I had the feeling that the Lynx tires would really shine on terrain with a bit more moisture. 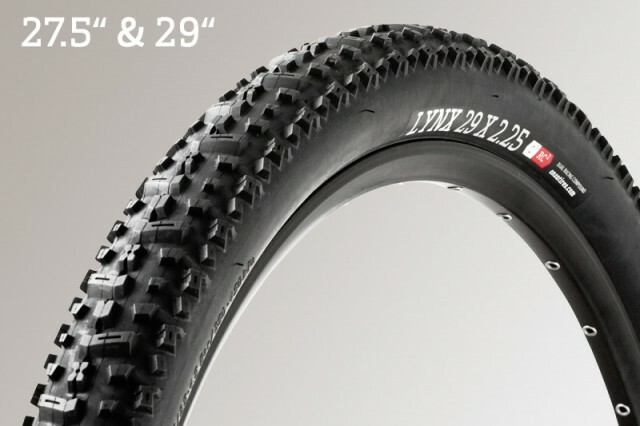 Onza recommends the Canis 29-inch tire for hard-pack, medium and loose-over-hard conditions, and gives it a rating of 5-out-of-5 for rolling resistance (I take this to mean it’s fast rolling) and 2-out-of-5 for cornering efficiency. The tire–as tested–is built on the C3 (Cross Country Casing) with a 60 TPI thread-count and comes with a folding bead. 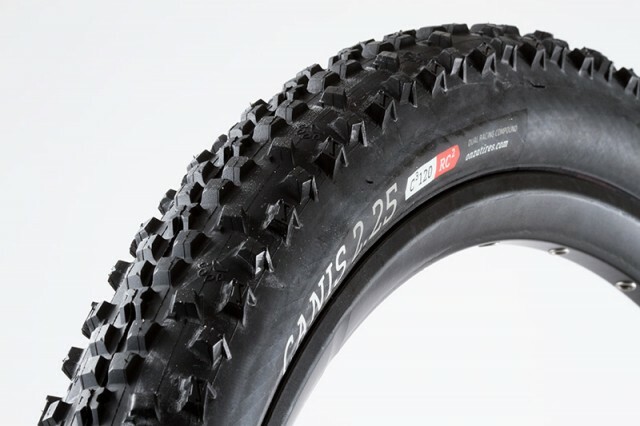 As with the Lynx, the Canis utilizes a dual compound tread (RC2) with harder 65a rubber in the center for speed and durability, and 55a rubber on the side for extra cornering performance. I have to admit that I was less excited to try the Canis tire; something about its more typical knobby look or maybe the natural sidewalls. Either way, my initial impression was quickly superseded by the tire’s performance. On the Onza website, the Canis is described as an all-mountain tire that is as "reliable as your neighbor’s dog." While I’m not sure I get the dog reference, the Canis proved to be very predictable in almost any condition. The tire found good grip climbing and descending in all test situations, some of which were very steep and loose. Although this tire is far from what I consider to be an aggressive knobby, when cornering, I felt that there was sufficient feedback to push its limits. I’d give the rolling resistance a 3-out-of-5 and cornering a 4-out-of-5. The Canis is a capable and versatile cross-country tire. Although all test conditions were dry, I suspect that the Canis would also perform pretty well in wetter conditions. The many small knobs hook up well in variety of conditions and a relatively shallow tread keeps things rolling fast. It's also worth mentioning that for the duration of the test, the Canis was set up tubeless using sealant despite not technically being designed for tubeless use.